THE ROUND 4 (APRIL-MAY 2018) RESULTS ARE IN! CLICK HERE TO SEE THE LATEST MOZZIE RESULTS MAP FOR THE METRO SOUTH HEALTH REGION. HOW DO YOU COMPARE TO YOUR FELLOW ZIKA MOZZIE SEEKERS? 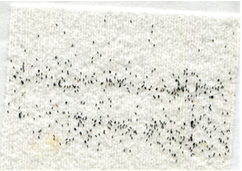 Paper 'egg collection strip' – female domestic mosquitoes will lay eggs on the strip (one per trap). This ‘egg strip’ will be sent to the laboratory for testing. Paper clip – to attach the paper strip to the water container if necessary. Blotting paper – to soak up excess water (do not rub!) from the egg strip before sending in the eggs. Sealable bag – the damp egg collection strip will be placed in this sealed bag to keep the envelope dry. Pre-addressed envelope – insert the sealable bag (containing the damp egg strip) into this envelope and post it back to us for testing (the postage is paid). To collect mosquito eggs you need to create a basic egg trap, known as an 'ovitrap', where mozzies like to breed. Most of the items you need are supplied in the free 'mozzie egg collection kit' we have sent you. However, you will need to supply a suitable plastic container, such as one from your recycling bin. 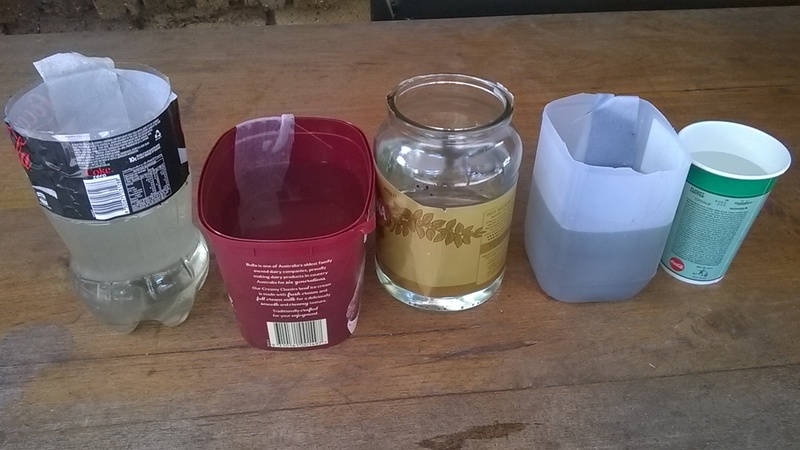 1 Select your container: A plastic milk carton, soft drink bottle or ice cream bucket is ideal (examples pictured below), especially something large (a two-litre bottle, for example) because it is less likely to fall over. Dark containers work best because dark colours are more attractive to mozzies. If you don't have a dark container, you can place your light coloured or clear container inside something like a black plant pot bucket (shown below). 2 Cut the top off your plastic container and double rinse it with clean water before use. 3 Hang the paper egg collection strip on the inside of the container, so that it touches the bottom, and fix it to the side of the container using the supplied paper clip or similar. Trim off any excess strip from the outside of the container. 4 Fill the sawn-off container with tap water to about three-quarters full – enough to last undisturbed for two weeks. 5 Add one of the supplied lucerne pellets to the water, which will help attract female mozzies (more than one pellet will foul the water). Once your trap is ready, leave it out in your backyard, front yard or balcony for two weeks (14 days). The mozzies should lay their eggs on the paper egg collection strip in the trap. out of the rain and wind and away from hoses or sprinklers. Ideal locations for your trap are under eaves, under a verandah or close to a fence. Note: the eggs need to remain unhatched, so they can be analysed in our laboratory. Once the trap is set, do not re-fill the water or splash water over any eggs because they could hatch! 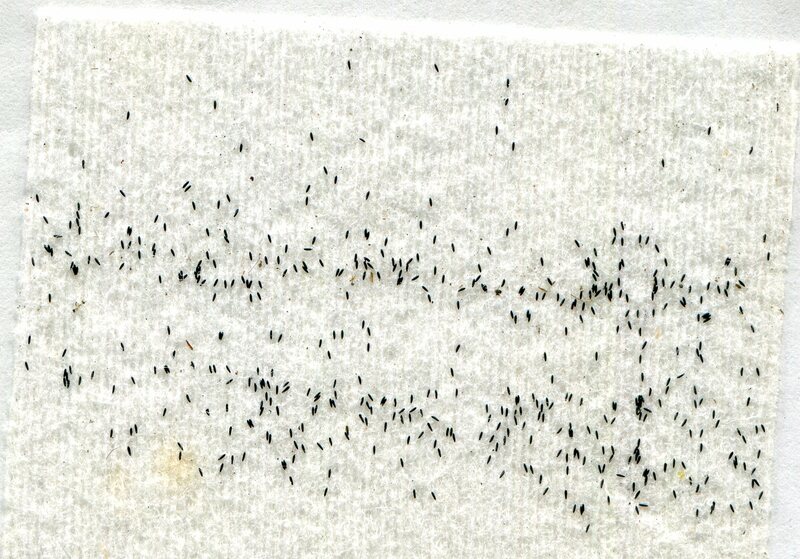 However, if you see any hatched mozzie larvae (the "wrigglers" pictured below), please remove them from the water. Once the trap has been outside for two weeks, check it for mozzie eggs. Do you see any on the egg collection strip? Don’t worry if you’re not sure – they can be confused with dirt or eggs from other creatures. If you can see mozzie eggs, please send the egg collection strip back to us using the barcoded, sealable bag and pre-addressed envelope provided. If you can’t see any mozzie eggs, you're welcome to leave the egg trap out for one more week (or you can return the egg collection strip to us now). We’ll send you a reminder to return the collection strip in another week. After two weeks (or three if you took the option of an extra week to collect eggs), please post your egg collection strip to us so we can test the eggs. Note: please return the egg collection strip to us, even if you have not collected any eggs at the end of the process. 1 Remove the egg collection strip from the trap. Mop up any excess water on the strip by placing it on the supplied blotting paper for a few seconds. 2 Wrap the damp egg collection strip in the blotting paper and place it in the barcoded, sealable bag supplied. Seal the bag to prevent the envelope getting wet. Please keep the barcode on the bag and the envelope. 3 Place the sealed bag into the pre-addressed envelope supplied and post the envelope to us. The envelope is postage paid so it won't cost you a cent to send. Thank you for being a 'Zika Mozzie Seeker' and supporting this important research. In the next few weeks we will send you results about the eggs found in your trap. Look out for an email and SMS message. We use DNA analysis to test whether the eggs contain mozzie species that can potentially carry Zika or dengue viruses (Aedes aegypti). Your eggs will be pooled with others in your area to provide a group result. At the end of the process we will give you results about the number and type of mozzie eggs found in your trap. We aim to produce a "heat" map showing the level of mozzie activity in your area. If 'Zika mozzies' are identified in a particular group result, we will contact all participants from that group. Emergency eradication will take place wherever such mosquitoes are detected. 1 Receipt of 'egg collection kit': a chance to confirm whether you received your ‘egg collection kit’. 2 Reminder 1: after one week (7 days), we’ll remind you to check your trap for progress collecting mozzie eggs or set up your trap if you haven’t done so already. 3 Reminder 2: after two weeks (14 days), we’ll remind you to return your ‘egg collection strip’ to us if there are mozzie eggs on it, or leave your trap out for another week (optional) if you can’t see any mozzie eggs yet. 4 Reminder 3: a final prompt to return your ‘egg collection strip’ to us, if you haven’t done so already, even if there are no eggs on it. 5 Results: where to find info about the number of eggs collected in your trap and mozzie activity in your area, including our online 'mozzie map'.